To work hard is great. But what good is all that hard work, if we do not take the time to unwind and relax? We owe it to ourself to maintain a balance of health and harmony. Half a day is what I set aside at Rejuve Spa at The Lalit Ashok, Bangalore. Prior appointments are a must! Rejuve, the spa offers various packages you can chose from, and customise to your liking. The added bonus to Rejuve the Spa is their Salon and top of the line beauty treatments they specialise in. So you look radiant and completely relaxed walking out. It is open to Non Resident guests, prior appointment is a must, as they cater to the resident guests and it is mostly packed for the day. You can avail a membership which can be used across India at all their outlets based at the Lalit Ashok. Rejuve, The Spa is one such luxurious sanctuary, to unwind, and I recommend a visit to see for yourself. It is part of The Lalit Suri Hospitality Group’s Signature Brand. 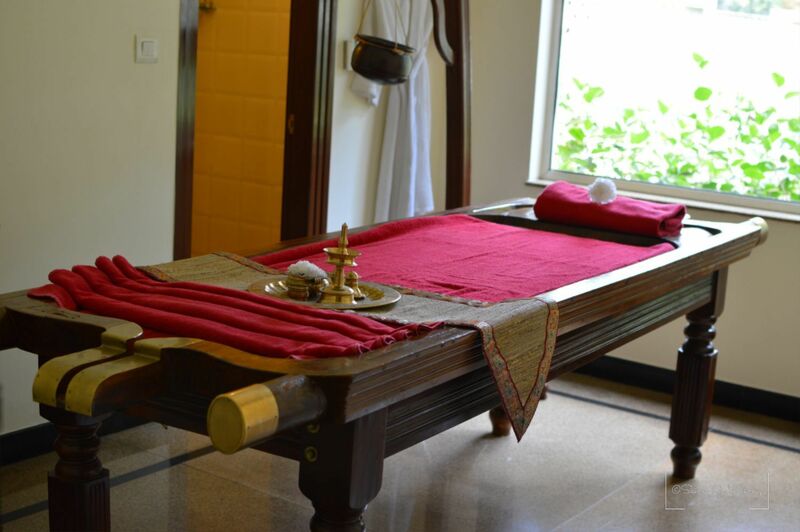 Where you experience a holistic experience through the various Ayurvedic, herbal and natural therapies. Located at the Lalit Ashok, Bangalore, Rejuve Spa is set against a sprawling lush green lawn and a swimming pool by the entrance, gives it an exotic holiday charm. I got served Green tea with honey. Post that a quick change into a comfy robe and whisked away for the treatment to begin. This treatment promises to relieve stress and reduce fatigue, at the same time renewing the body. The therapists, first begins with a Swedish oil therapy massage technique. I was so relaxed. The oil used had a mild orange zest aroma. The Tamarind and Cane Sugar scrub post that left my skin tingling during the process, as the therapists scrubbed the dead skin off. The therapy was a 90-minute session. The technique combined the focus of acupressure on the reflex points of your feet, hands, back and shoulder. I felt the energy buzz, as my body came alive. I could have sworn the therapist had healing hands. A nice shower later, I was completely relaxed and yet feeling vibrant! I am the last person to get a facial done, as my skin is sensitive. But here it was a herbal scrub with light pressure applied and cleansed with a face mask. I saw the results as soon as it was done. I had a lovely glow. (lasted a whole week). As I keep getting my hair coloured, it tends to leave it dry and brittle over a period of time. The only way to maintain is by regular hair spa’s. Rejuve Spa has a full fledged salon, and every hair product is available. They have top of the line hair stylists who understand your hair and guide you for the right treatment. Whilst I sipped on Rejuve Signature Tea, the hair stylist, covered my hair with Loreal hair spa mask (Repairing Creambath and boaster to get the strands stronger and retain the colour) as I had just gotten my hair coloured, he had to use a mask for coloured hair. Left for about 20mins and steam. Post the rinse, a light blow dry and my hair was silky soft. • Always, book in advance and try and arrive 15 minutes early, so as to allow time to let your senses begin to relax. • Switch off your Mobile or keep it on Silent Mode during the therapy, you need a break and so does your phone! • Remember to hydrate yourself with lots of water after your Spa treatment. About Lalit Ashok – Nestled amidst 10 acres of sprawling landscaped and manicured lawns, The LaLiT Ashok Bangalore is one of the finest luxury hotels in Bangalore. Strategically located in the highly secure diplomatic enclave of Bangalore, The LaLiT Ashok offers an exquisite view of the adjacent 18-hole golf course. The hotel showcases a contemporary and elegant ambiance distinguished by the latest in business technology, modern amenities, and impeccable hospitality. Besides its exclusive location, the hotel is known for its contemporary dining options and the city’s largest banquet facilities.